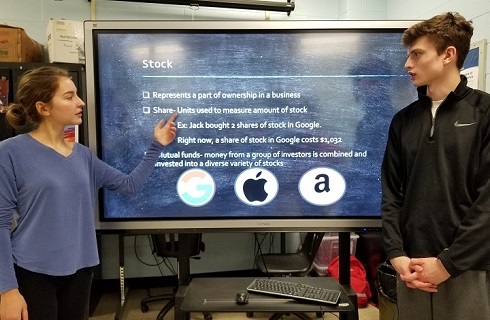 One Bridgeport Middle School classroom had the opportunity to learn about financial planning, thanks to two students from Bridgeport High School. Madelyn Lalama and Jake Runner launched a program called, “Save Now, Earn Later,” which they created to educate middle school students about saving, investing and managing money. The duo worked with Bridgeport Middle School teacher Kenny Edwards to organized the best time to present to his eighth grade AA class. With the exception of a few snow days, they led the class through the program each week in December and finished in January. Lalama and Runner started the program with a pre-test to determine what the students already knew about finance. They used trivia, games, and hands-on activities in order to demonstrate the basics of budgeting, investing and saving. The students not only demonstrated improved knowledge in the post-tests, but seemed genuinely interested in learning about the topics. The finance project, including curriculum and tests results, will be entered into the West Virginia DECA Competitive Events in March. Lalama and Runner will present it in order to qualify for the International Career Development Conference in Atlanta, GA in April. Edwards is excited about the possibility of working with the DECA students as well.